Sustainable Brands was founded in 2006, with the vision of developing a global community of business innovators who would come together to co-create the future of commerce. The network has since grown include thought leaders, brand strategists, marketing executives, product and service innovators, and other change agents from several hundred of the world’s most influential companies. There are many ways to participate in the network. The website has a wide range of resources including webinars, reports and tools, as well as weekly news and articles covering every aspect of sustainability. There are now also many Sustainable Brands events across the world, which allow professionals to network, collaborate and inspire each other. This year has already seen three Sustainable Brands events hosted in Istanbul, Rio de Janeiro and San Diego, with three more taking place in London, Buenos Aires and Kuala Lumpur, in addition to Sustainable Metrics. I am very excited to be taking part at Sustainable Brands in London in November, where I will be discussion Maria’s my own work on Holonomics and holonomic thinking, and how this applies to strategy, innovation and the evolution of brands. The theme of the event is Reimagine, Redesign, Regenerate, and so in discussing the shift in consciousness to holonomic thinking, I will be able to explore how we can see the world with new eyes, and what the comprehension of authentic wholeness means for brands, marketing and the new economy. 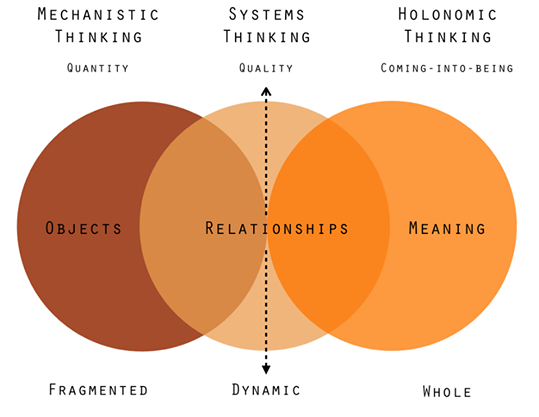 The conscious shift into holonomic thinking is one that facilitates a shift into comprehending the meaning of phenomena at the deepest level. It is a dynamic shift which allows us to see the coming-into-being of a phenomena, and this applies as much to brands as it does to comprehending the coming-into-being of natural phenomena, such as colours, plants, and the organisational principles found in complex systems in nature. I hope to be able to see some of you there, taking a deep dive into the shift from economic brand value to holonomic brand value, and co-creating a brighter, connected, and authentic future.